Jordan is a beautiful country It is wild, with limitless deserts where the Bedouin roam to it's mountains of the north, which are clothed in green forests. Where the Jordan River flows, it is fertile in both summer and winter. It has a strange haunting beauty and a sense of timelessness. Dotted with the ruins of empires once great, it is the last resort of yesterday in the land of tomorrow. Jordan is also famous for its massive ancient castles, such as Karak and Shobak, where mock battles can be fought and won (or lost), and mediaeval banquets are served under the vaulted walls and mighty ramparts. There is Jerash - a Rome away from Rome, where chariot races and gladiator-style challenges are par for the course. The small Kingdom of Jordan occupies a strategic location in the Middle East. This arid and ancient land (of biblical fame) has witnessed centuries of conquests and invading armies. After World War I ended, the Ottoman Turks were finally driven out, and the British influence began. The modern (and historic) city of Amman, the capital city, is only five hours driving time from anywhere in the country, and it serves as the administrative and commercial center. 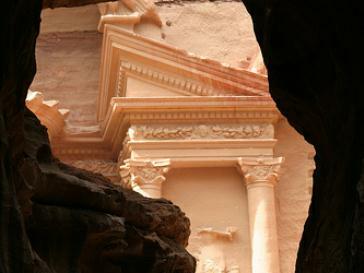 The country's major tourist attraction is the rose-red city of Petra, founded around 1000 BC. Relative Location Jordan is in both the northern and eastern hemispheres. Positioned in the Middle East, a recognized geographical region of southwestern Asia, the country is bordered by Israel, Syria (Golan Heights), Iraq and Saudi Arabia. Landforms Jordan is generally a flat desert plateau, east and west, as the western edges of the Syrian and Ard As Sawwan deserts stretch across the land. In the west, the Great Rift Valley (high hills and mountains) separates the East and West Banks of the Jordan River. Significant bordering bodies of water include the Dead Sea, the Gulf of Aqaba and the Sea of Galilee. Land Divisions 12 governorates, including: Ajlun, Al 'Aqabah, Al Balqa', Al Karak, Al Mafraq, 'Amman, At Tafilah, Az Zarqa', Irbid, Jarash, Ma'an and Madaba. Attractions The capital city of Amman, and its 19 hills of stone houses and historical sites, the legendary city of Petra, Agaba and its clean sandy beaches, dozens of crusader and desert castles, and the wide variety of biblical holy sites - to name but a few. Climate: Jordan is hot and arid in the summer months, especially in the desert areas and along the Dead Sea. Milder fall and winter conditions in the hills and mountains of the west are common. Jordan's famous Dead Sea resorts provide a more relaxed, therapeutic, experience. Here are the exclusive spa resorts, where self-indulgence and pampering are the order of the day and work-worn delegates and other visitors emerge feeling at least 10 years younger and ready to face the challenges of life with newly discovered vitality. In this land of mountain, valley and desert, Jordan has mineral springs, areas of forest, and surprises. It is a land of history, possibly, even, it is the land where history began.